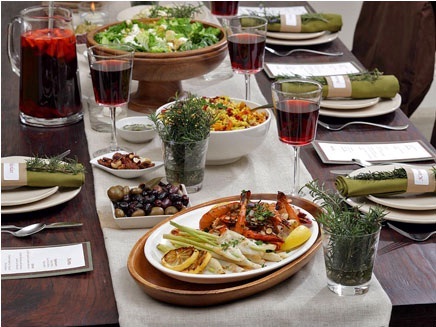 Are you planning for a diabetic-friendly dinner party? Everyone loves a dinner party but a plate packed with typical potluck fare contains twice the calories that limit the diabetics to join the party. When anyone plans for a party for someone who is suffering from diabetes, he/she may feel anxious to give up his/her favorite dishes all together. Without altering your menu entirely, you can make the diabetic-friendly dinner foods. Just change the method of preparation. People having the diabetes can enjoy an appetizing and fun party with a few simple adjustments to the menu and healthy meal plan. No magical diabetes diet is available for diabetics so it is essential to remember some guidelines such as moderate sugar, portion control and low fat. As well, it is important to keep in mind the healthiest way to eat. Diabetic-friendly will allow you or your guest to keep calories to a least amount and also help to control blood sugar levels. To save on calories, no one should have to sacrifice taste. In this article, some simple tips are provided that will transform your party menu into a winning host and everyone will enjoy a healthiest meal without difference in taste. You can also pass these tips to your friends and loved ones so they can also be more diabetic-friendly. Diabetes increases the risk of developing heart disease. Therefore, it is essential to consume heart healthy foods. Appetizers are a significant staple of party menu whether it is a pre-dinner snack or something that is catered for the whole event. The most favorite snacks of people are chips and dip. Your guests will also go for them. In place of high fat ingredients and greasy chips, you can load them with healthy ingredients. Refined carbohydrates can cause a rapid rise in blood sugar and can generate a bad situation for diabetics. To increase nutrition and decrease added fat, try to make your own chips by baking high fiber whole-wheat pitas and cutting them into triangles. The fiber present in whole wheat will help to stabilize blood sugar by slowing down digestion. It is also better to cut cucumber rounds and squares of colorful bell peppers to utilize it for more nutritious low-carb "chips." Ensure that the foods you are selecting must be low-fat dairy ingredients for example skim milk and reduced-fat cream cheese as it will reduce your intake of unhealthy trans and saturated fats. Whole milk provides 160 calories and 8 grams of fat per cup, while skim milk provides 90 calories and 0 grams of fat per cup. And it is fact that whole, low fat and skim milk all contain the same amount of calcium and protein, only the difference is the amount of fat. Load up your dish with extra vegetables. Add tomatoes in your dip or include extra spinach further than the recipe calls for. Through this way, you will add more nutrition and feed your friends on fewer calories. If you want to be a winning host, then you must watch the portion sizes. Using the plates which are smaller in size is a fast and easy way to reduce overdoing it at a party. Also, it will help your guests, especially diabetics, to do portion control, whether they become conscious for it or not. Since the 50s and 60s, plates whether at home or restaurants have been improved in size, changing our "normal" portions to bigger together with our waists. Your choice of drink can impact on waistline if you do not select it wisely. On a normal day, Americans take in almost 200 calories a day from alcoholic beverages and sweetened drinks, and at a party that number is increased to even more. Provide your guests another option from the drink mixers and sugary sodas. Seltzer, sparkling mineral water and club soda have no calories or sugar so you can use it as alternative to tonic water and sweetened sodas. Also, keep jugs of low-calorie tea and water and lemonade on hand. Add healthy fruits such as lemons, berries or chopped watermelon and peaches with your drink options. Instead of Beer, switch to a glass of red or white wine as it contains fewer calories and the antioxidants present in them may help to fight heart disease. In a party, desserts are the most expected part of the meal but diabetics think that they have to stay away from desserts. Nowadays, many sugar alternatives are available for diabetics so you will face no problem making simple ingredient switches to your much loved desserts and therefore everyone at the party can enjoy. In the supermarket, you can easily find sugar-free pudding mixes in a variety of flavors. The plenty of flavor options are available from pistachio to banana cream and chocolate to cheesecake that will offer you a broad variety of desserts, making it simple to reduce the carbohydrates and sugar. You will surely get rave reviews by adding whipped topping, fat-free angel food cake, sugar-free pudding and your beloved berries for a stunning low sugar, low-fat bite of decadence. Remember to use reduced-fat cream cheese and skim milk, as they are flawlessly fine to bake with, as well as you will reduce the amount of unhealthy fats while maintaining all the flavors.